Don't you love it when two different “worlds” come together and mesh well, so you feel like you're on the right track? You may know that I've been a Weston Price Foundation fan for many years now, since what I call my “food conversion” when I found the truth about real food. Well recently I also learned about the benefits of fasting, so when I saw Sally's article in the WAPF journal where she touched on this, I was so happy! Today I'll share about the benefits of fasting for health reasons. Since diabetes is so prevalent in my family, I'm on a mission to NOT get it myself, yet in recent years my blood sugar numbers were creeping up even though my diet is pretty good. (Although not perfect of course. I'm talking to you wine and sweets.) So I've been on a mission to figure this out, and notice I said my numbers were going up, because recently my A1C went DOWN, from 5.2 to 5.0, yahoo! I love the home A1C test kits so I can easily keep an eye on it. And yes, I know that even 5.2 isn't terrible, but I didn't want it to just continue getting worse over time. 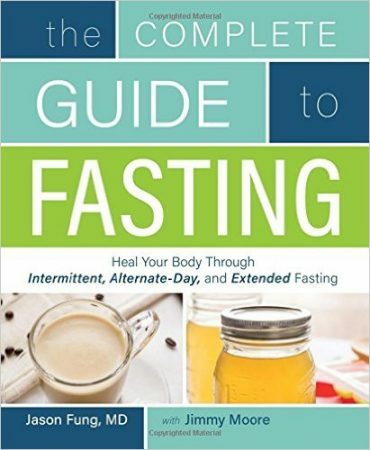 And lastly, thankfully I found out (via Jimmy Moore) about Dr. Jason Fung and his book, The Complete Guide to Fasting. Have you also seen this newer post? Exciting Drug-Free Help for Alzheimers (also for Diabetes, PCOS and other Chronic Diseases) Hint: it’s NOT about Eating More Vegetables. Life is not fair, and the way it is most unfair lies in the fact that some people gain weight easily while others can eat just about anything they want and never gain an ounce. Even more unfair: the most common situation in a couple is a husband who can eat thousands of calories per day and remain slim while his wife slowly puts on weight even though she tries to watch what she eats. The situation gets worse at menopause, a time when most women naturally put on weight. Long-term, permanent weight loss requires a complete change in lifestyle, including rejection of all processed foods, adopting a schedule of regular meals and, above all, dedication to nutrient-dense foods. If your diet is not supplying all the vitamins and minerals your body needs, the urge to eat will eventually overcome the best of intentions and the strongest willpower. Let’s assume you are the typical American eater—consuming mostly processed food, trying to avoid fats and following a chaotic meal schedule, with lots of between-meal snacking. You have packed on the pounds and probably have developed several other health problems. You crave sweets and crunchy foods like chips. You have tried many diets, always starting with the best of intentions, but always giving in to hunger and temptation. Where do you start? How do you lose weight without feeling hungry and deprived all the time? 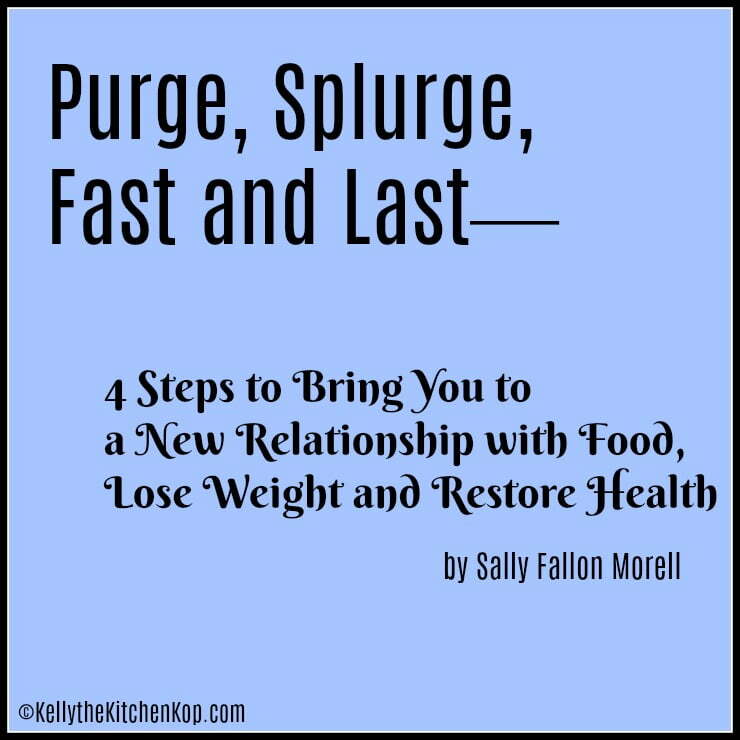 Here’s my formula: I call it Purge, Splurge, Fast and Last—four steps to bring you to a new relationship with food, lose weight and resolve health problems. If you have already been on a Wise Traditions diet for some time but still need to lose some weight, you won’t need the first two steps, but can jump in at Fast and Last. The first step is purging your kitchen—that means going through your cupboards, pantry, fridge and freezer—and stashes throughout your house and even in your car. Get some big plastic bags and throw out every item that isn’t healthy and clean. Don’t berate yourself for “wasting” food—what you are throwing out is worthless anyway. Now replace what you have thrown out with real food—see “The Wisely Stocked Kitchen” for guidelines. That means healthy fats like butter, olive oil, lard, coconut oil and duck fat; good natural proteins like meat, fish and eggs; artisan cured meat products such as bacon, salami and pȃté; whole grains you will prepare yourself; genuine sourdough bread and healthy crackers; natural sweeteners; raw nuts made into crispy nuts; natural fermented sodas like kombucha; lacto-fermented condiments and naturally made ketchup, mustard and mayonnaise. Now that you have all the good foods at hand, especially good fats, you can give yourself permission to eat them. Many have told us that when they give themselves permission to eat butter and other traditional fats, they can’t help splurging on these fats for many months. And that’s okay! Go ahead and eat as much of these fats as you want. Put them on everything—vegetables, meat, fish, and porridge. Spread butter thickly on sourdough bread. Put cream on your fruit and in your sauces. Add extra yolks to your scrambled eggs. The key thing during the splurge period is to get used to three meals per day, with absolutely no snacking between meals. Eating plenty of fats with your meals will keep you from feeling hungry in between. Try to get on as regular a schedule as possible, eating breakfast, lunch and dinner at the same time every day. This is the period to catch up on all the nutrition you have been lacking while on the standard American diet, so it’s important to include nutrient-dense superfoods at every meal—raw whole milk, raw cheese, yogurt, cream and butter from grass-fed cows, liver and other organ meats, bone broth and fish eggs, shellfish and oily fish. Supplements should include cod liver oil (for vitamins A and D), high-vitamin butter oil or emu oil (for vitamin K) and desiccated liver (for vitamins B12 and B6, iron, zinc, phosphorus and many other minerals). Moderate consumption of carbs during this period is fine—especially carbs with lots of butter—and while you don’t need to eliminate sweets completely during this period, you should eat them only in moderation—and only homemade sweets such as natural ice cream, nut-based cookies and stewed fruit with cream. Consume these after a full meal, not between meals. You may find that you don’t even want dessert if you have eaten enough fat with your main meal. Lacto-fermented foods such as sauerkraut, beet kvass, kefir and kombucha are important inclusions. The splurge period is also a good time to cut back on stimulants such as coffee, tea and chocolate. Instead of coffee, have a cup of bone broth or coconut oil and molasses dissolved in hot water. You probably won’t lose weight during the splurge period—although some people actually do—but your weight will stabilize and you may see many pesky health problems disappear. The key is to get used to regular meals and nutrient-dense food. Once you have gotten used to the Wise Traditions diet, you can move to the weight-loss stage, which involves what’s called “intermittent fasting.” That means a period of more than twelve hours—ideally up to eighteen hours—without food. As explained by Dr. Cowan (see page 24), if we go twelve hours without eating any food—protein, fat, or carbohydrate—we run out of the stored glycogen starch in our liver, which is there to get us through a twelve-hour fast. After twelve hours, the hormonal situation switches over to make glucagon, which signals to the body to mobilize stored fat and turn that into sugar in the blood. The fast also helps you release fat from your liver and toxins stored in other parts of your body. This means that you are going to eat either breakfast and lunch, or lunch and dinner. My preference is the former—a substantial breakfast in the morning and then a fairly large lunch around one o’clock in the afternoon. If you have to cook an evening meal for your family, you can console yourself by looking forward to the leftovers the following day. In the fasting stage, you will need to cut back on carbs, but not completely eliminate them. For the most part, you’ll need to cut out sweets and eat slightly smaller meals. The key is to continue with nutrient-dense foods and plenty of fats to keep the hunger pains at bay. By eliminating one meal, not only do you switch to fat-mobilization mode, but you also reduce your caloric intake. As you can still eat two satisfying meals each day, there is no sense of deprivation. Be sure to consume plenty of liquids—such as broth, kombucha and water—and continue with your exercise regime. You should lose weight slowly and steadily during the fasting stage—count on three to five months to lose a dress size. The time may come, however, when you hit a plateau. That may mean you have reached your ideal weight (which is probably higher than what you hoped to attain) or need to embark on a more vigorous exercise regime. Here’s a good website for calculating your ideal weight. You have lost several dress sizes (or shirt sizes) and you do feel better—now what? The key to maintaining your weight is to continue with nutrient-dense foods and a regular schedule of eating, with no snacking, no between-meal eating and no processed food. You may need to skip a meal several times per week to maintain your weight, but by now you are used to that. The rest of the time you can enjoy three normal meals per day, high in fat and moderate to low in carbs. This is not a yo-yo diet plan, the kind where you lose weight quickly and then gain it all back and more. Weight loss is slow and steady, and carried out in such a way that you improve your health and nourish your body, not starve yourself of nutrients. The plan does not punish you and requires little willpower—only wise choices and a hefty dose of resolve. Purge, splurge, fast and last: it’s a plan that can work for everyone. VITAMIN A: Critical for hormone production, thyroid function, healthy lungs, cell function and just about everything else. As a whole, Americans are grossly deficient in vitamin A. Best sources are cod liver oil (take every day), liver (eat several times per week), butter, cream and eggs. VITAMIN D: The companion to vitamin A, vitamin D plays an important role in insulin production and weight loss. Best sources are cod liver oil (take every day), egg yolks from pastured hens (eat every day), poultry liver, lard, bacon, shellfish and fish eggs. VITAMIN K: Good vitamin K status is associated with better body weight and less abdominal fat in younger adults, and lower weight gain in menopause. Best sources are high-vitamin butter oil or emu oil (take every day), duck or goose liver (consume weekly), duck or goose fat (use frequently) and hard aged cheeses (eat frequently). B VITAMINS: All the B vitamins work to help you make more energy in your cells; choline is especially important. The best sources of choline and indeed all the B vitamins are liver and egg yolks. Soaked whole grains are another good source. VITAMIN C: Vitamin C is key to healthy adrenal function, healthy gums and many other processes. Best sources are lacto-fermented foods (eat daily) and fresh fruits and vegetables. Those with high requirements for vitamin C can take a natural supplement such as Amla-C.
CALCIUM AND PHOSPHORUS: Many diet plans leave people short of these key nutrients. Best sources are raw milk or raw cheese (consume daily), yogurt and kefir. ZINC: A cofactor for vitamin A and needed for over one hundred enzymes in the body, the modern diet of processed food is a recipe for zinc deficiency. Best sources are red meat, liver and shellfish (eat frequently). IRON: Critical for healthy blood and prevention of anemia, the best sources are red meat and liver (eat frequently). BENEFICIAL BACTERIA: Good gut flora are associated with lower weight! We get beneficial bacteria by eating lactofermented foods like sauerkraut, beet kvass and homemade kefir and yogurt. COCONUT OIL and OTHER COCONUT PRODUCTS: Coconut oil is high in medium-chain triglycerides, a type of saturated fat that is never stored as fat but which the body uses to boost metabolism. A good way to get a recommended one to two tablespoons per day is to put the coconut oil in a mug with one tablespoon molasses and a pinch of powdered ginger. Add hot water and enjoy as a hot pick-me-up—much better for you than coffee! DATES: Hankering for something sweet after a meal? Dates are your answer. Have a date or two, or date meat mixed with coconut. You’ll find that dates will quickly quell the craving. BUTTER: The queen of fats, put butter on everything! Butter will help you absorb all the nutrients in the foods you eat and make all your food delicious and satisfying. Plus, three components of butter (iodine, vitamin A and butyric acid) are necessary for robust thyroid function. BACON: The combination of fatty, crispy, salty and sweet make bacon the ultimate comfort food and there’s no need to leave it out of the Fast-Last part of the diet. Have bacon for breakfast and put bacon bits on a hearty chef’s salad at lunch and you will never feel deprived! This article first appeared in Wise Traditions in Food, Farming and the Healing Arts, the quarterly magazine of the Weston A. Price Foundation, Spring 2017.